If you are looking for a FE wide angle lens then this is the one. Other than that, the rest of the lens is in pretty nice condition. The lens blades are clean without oil on them. The lens focuses smoothly and it's in excellent working order. This is a Excellent Condition Hasselblad 50mm F:2.8 FE wide angle lens. The original lubricant used in these lenses is known to cause the aperture blades to stick causing improper exposures when in use. Glass is in good condition, no major scratches or optical flaws. I have tried to picture it in the last photo, but it looks way worse in the photo that it actually is. We are not responsible for any such fees incurred. From the estate of a photo enthusiast. Strictly hobby usage and pampered with a foam fitted hard case. Comes with original box, leather case and 2 lens hoods. Big light lens, beautiful glass. See my other listings for more Hasselblad. This lens is in excellent condition and is being sold as is. Filter / Adapter. · Include Front and Rear Cap, 93/50 Filter / Adapter. · Lens front glass ( See Photo ). 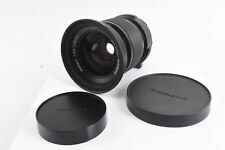 · Lens glass and mount is good - No Fungus, Haze, Scratch. · All functions operate properly. Condition Classes Near New. Near New Pre-owned, almost no signs of use. More than 2,000 deals with good evaluations. Good Works okay, with signs of use. Our inventory changes too frequently to update every item we carry on the website. ◆Optical system◆. Aperture blades work smoothly. It works properly. ◆Functional◆. ◆Includings◆. 50mm F2.8 T Mint condition from Japan. This item is sold out everywhere in Japan and very hard to get it! ◆Functional. ◆Appearance of the item. Made in Germany. You can enjoy taking photos with the lens in good condition. Excellent ! The state is superior as used goods. Condition Grade Excellent . We clean every product carefully and confirm the function by loading a film and taking photo. The product inspects it carefully one by one. Apply for: 80mm f/2.8, 150mm f/5.6, 50mm lens. Optic/Glass: no haze, no fungus, no scratches. The focusing barrel just lubed to Hasselblad standards, with Hasselblad factory grease. Because the paint Carl Zeiss uses attracts oils. Removing the black paint will not affect your image quality, most manufacturers don't do that, most Carl Zeiss lenses that I have worked on do not have that. BOX ONLY and includes the sturdy styrofoam inserts. From 1991.